We are now progressing towards 0.8, and thus there are lots of radical new changes being made. Perhaps most notable is the new, improved challenge system, referred to as the overworld. Basically you drive around in a special large track from where you can launch challenges from certain places. But don't just take my word for it; have a few screenshots as well! Here's a brief overview of most of the overworld. Big, innit? Outside the camera view there's a garage in which you will be able to change karts. 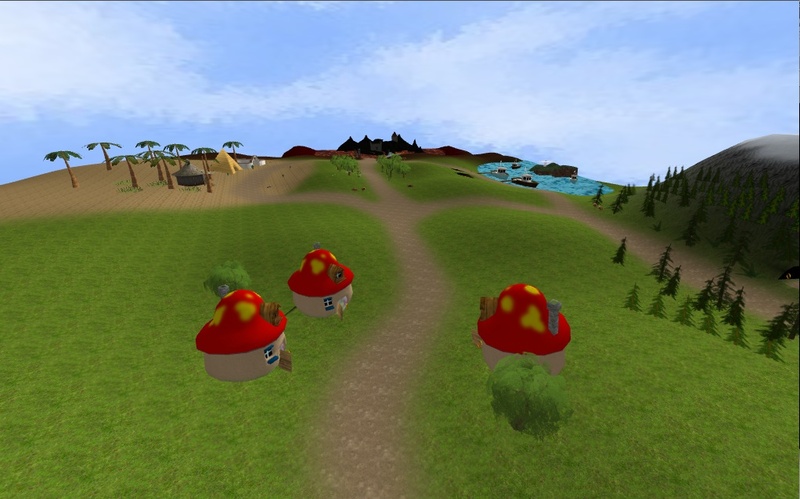 In front you see a small mushroom village where some of the challenge start points are. To the right you can see a mountain area with three caves where the mountain-themed challenge start points resides, and further back to the right there's a small ocean with more challenges. Center left there's a small forest/plant area with some challenge orbs, and farthest from here is a technological area and Nolok's castle. To the left is a desert area with the hacienda, pyramid and Zen Garden hut. The overworld is very much a work in progress, and the screenshots does not convey the final result, but gives you an idea on what "the overworld" means. Here's the view from the opposite end of the overworld. Front center we see Nolok's castle with lava surrounding it. Further back we get a somewhat better view of the technological area, with a rocket made by new contributor ctdabomb, the UFO from Star Track with a challenge orb, and a few more objects plus a cave with another challenge orb. The other stuff I've already mentioned. Here it's easier to see some new features in use. Most important is the texture splatting which makes texture transitions completely smooth. Also notice the brand new water shader which makes for better looking water. It's still not realistic, but it sure is better than just a plain moving texture. Not to worry; the blackness issue will be resolved when the move from multitexturing to shader texturing has been done. Also you can see yet another use of shader technology: the shields which protects challenge spots are semi-transparent, somewhat reflective spheres, resembling soap bubbles. Awesome! The number stands for points needed to enter the area. If you don't have enough points, the shield will reject you (not a problem in this case though). You will later get points by finishing challenges, which can be driven at your difficulty of choice, giving you access to more. You would get more points by solving challenges at hard, and you could only finish the game with all points by driving at hard. You would not need to always get all points in order to progress in the overworld however, but those who finishes with all possible points may get some sort of small bonus. There's a lot more stuff in the works as well, but these are the features which the next release focuses on, and the other stuff will be very nice bonuses if they are ready in time for 0.8. I don't want to create any pressure, so I'll leave them for later when they are more ready and likely to be included by default. Wow! Looks like it'll be awesome, can't (but will have to, obviously) wait to see it myself! What about replacing the old Tux Kart with "Alternative Tux" from the add-on sources? Genial, que des bon points, supertuxkart est entrain de devenir un incontournable dans le monde des jeux libres. Wow , its a amazing future!!! I can´t wait to play it. I just download and compiled the SVN on Fedora 16 KDE, have played around much. The overworld does look great, the menu is nice too.